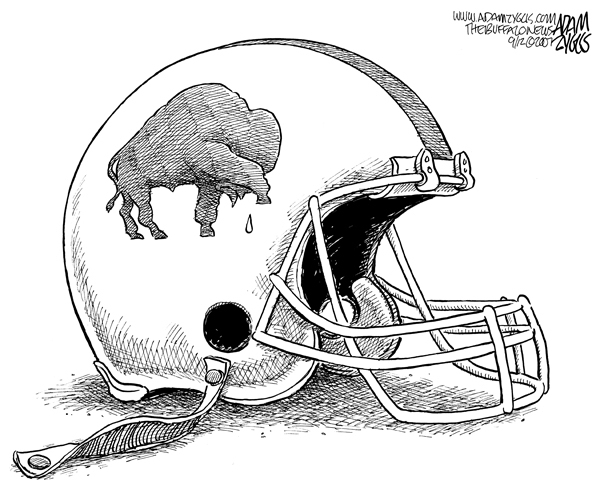 The cartoon above, drawn by Adam Zyglis in 2007, has been making the rounds of social media in the wake of Ralph Wilson Jr.'s death. The illustration, published Sept. 12, 2007, was in response to the injury suffered by Bills tight end Kevin Everett during the Sept. 9, 2007, game with the Denver Broncos. Everett went down after a collision with Denver's Domenik Hixon on the opening kickoff of the second half. Everett lowered his head into Hixon's chest to tackle Hixon and appeared to be knocked unconscious on contact before falling to the turf. Everett seemed to regain consciousness, but had no movement in his extremities. He was placed on a backboard and stretcher with his head and body immobilized and was loaded into an ambulance near the Broncos' sideline. Everett was admitted to Millard Fillmore Hospital with a cervical spine injury. A follow-up story Sept. 11, 2007, detailed the severity of the accident. "This young man suffered a potentially lethal and grave injury," said Dr. Andrew Cappuccino, an orthopedic surgeon and spine specialist who helped perform the surgery. "We are still greatly concerned. I want to emphasize that this was a potentially catastrophic injury." "Full recovery is a long shot. But the possibility of significant recovery is quite real, although we remain very concerned," said Dr. Kevin Gibbons, the consulting neurosurgeon involved in the operation at Millard Fillmore Hospital. Everett continues to make great progress from the catastrophic spinal cord injury he suffered six months ago on the turf of Ralph Wilson Stadium. He looks fantastic, carrying 240 pounds on his 6-foot-4 inch frame. He says he feels great. He now can walk continuously on a treadmill for 1 1/2 to 2 miles. "I want to let people know that through the blessings of God, anything can happen," Everett said in an interview with The Buffalo News. Everett came to town to promote his new book, "Standing Tall: The Kevin Everett Story." He will appear for a book signing at 7 tonight at the Barnes & Noble store, 1565 Niagara Falls Blvd., Amherst. "The main reason for me doing the book is I want to inspire a lot of people and let them know there's hope, no matter how difficult the situation is," Everett said. "Just have faith in God and believe."